International Day of the African Child is celebrated on 16th June every year to commemorate the 1976 student uprising in Soweto, South Africa. The 2018 theme is “Leave No Child Behind for Africa’s Development.” Unfortunately, child motherhood is a neglected global public health and social problem that is borne out of powerlessness, pressure, poverty and punitive policies. Yet our research shows the potential of child mothers to become advocates for change within their communities, helping to end FGM, child marriage, and to sensitise their peers to their sexual and reproductive health rights. Zawadi a young mother from Tanzania who fell pregnant when she herself was a child tells her story. I fell pregnant when I was just 16 years old and working in a restaurant in Mpwapwa Town as an attendant. The father of my baby had told me how much he loved me and how he wanted to marry me; I was shocked when he denied all responsibility, telling me he could not have fathered my child as he was still too young to be able to impregnate a girl. He was over 30 years old and I was just a child and yet he told me he was in no position to be a parent. At the time I was living with my grandmother and it was difficult to make ends meet; she was an old lady. My employer fired me, saying that I would have mood swings brought on by my pregnancy which would lose her customers. To make matters worse my aunts and uncles told me I had brought shame on the family and so they abandoned me. It was so painful. I have changed so much from the girl I was; in March 2017 I heard about Children’s Dignity Forum (CDF) and FORWARD and they trained me as one of their PEER Researchers exploring the difficult issue of teenage pregnancy in Mpwapwa district. During my research I learned that my experience was not unique; many parents disown their pregnant daughters, and this causes us to have psychological problems because we do not have support. I saw that many girls become sexually active because their parents can’t meet their basic needs- but we still get the blame when we fall pregnant. The finished report is something I am very proud of. I have gained so much confidence since working with CDF/FORWARD. I learned about SRH, life skills and completed the entrepreneurship and leadership training. I’ve become a strong agent of change by educating young girls, both in school and out of school about the impact of teen pregnancy. I’m also the Chairperson of CDF’s Mpwapwa Town Out of School Girls Club. I share my story with them- how painful being left alone to care for a child at such young age is. I am glad that they can ask me for advice. I can talk with confidence with my fellow club members. I’ve learnt important skills and lessons about leadership; a good leader respects the decisions others make for themselves, and avoids favouritism. CDF and FORWARD have helped me have a voice on a bigger stage too. Local NGOs who work on children’s rights know me well and I have a good relationship with them. It was great to attend the District Child Protection stakeholders meetings and the Girls symposium in Dar es Salaam learning so much from the other girls. I attended the National Parenting Forum. I learned so much including about the dangers children face online. I gave a presentation about the challenges that teenage parents in Mpwapwa face based on my PEER research and answered really difficult questions from the people there. The entrepreneurship training I received from CDF/FORWARD has given me the knowledge and skills to start a business, identifying viable business ideas and managing business. They gave me start-up capital and with this support I run a mini restaurant. To be honest, this restaurant is my hope now and I am dedicating all my energy to it as is it the place where I get money to support myself, my child and my grandmother. All I can say is I am very thankful to CDF and FORWARD for the training as it has opened my eyes and now I see so many business opportunities in Mpwapwa. My hope for the future is to return to school to build a better career. I am investing in my mini restaurant so I can save enough to pay for tailoring school. For now, with the help of Mpwapwa club members I want to expand the mini restaurant so that we can become the biggest caterer in Mpwapwa. Then we can employ our fellow young mothers. We all dream of having several businesses including keeping livestock and sheep. 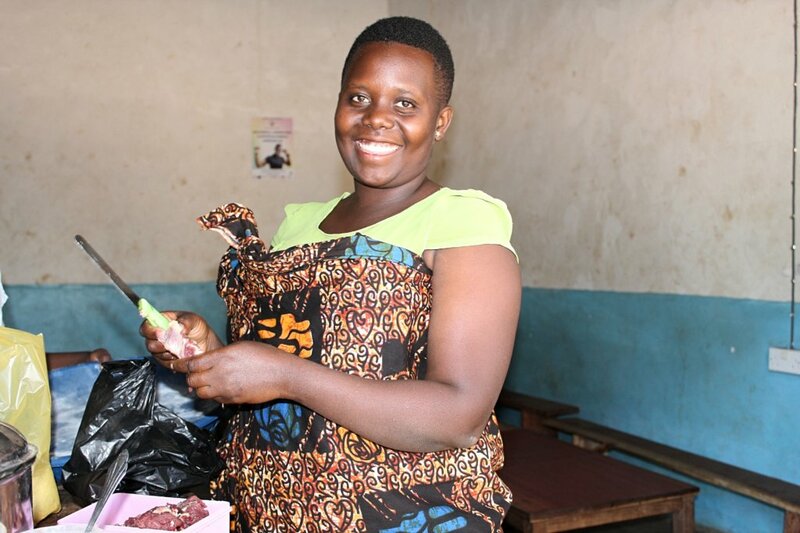 Zawadi contributed to our report “I have no Idea how I got pregnant” Participatory Study on Teenage Pregnancy and Child Motherhood in Mpwapwa District, Tanzania which was published in June 2018. Find out more about our Make Child Mothers Count in Tanzania project which helps girls like Zawadi build a brighter future for themselves and their children.